One day years from now you may find yourself sitting snugly in a tube, hurtling from San Francisco to Los Angeles at 800 miles an hour. Elon Musk, founder of SpaceX and co-founder of Tesla, released a 57-page report today detailing his super high-speed transportation solution, called Hyperloop. Musk brought the idea back to the fore about a month ago, but after pulling an all nighter, he's out with some specifics. "Hyperloop consists of a low pressure tube with capsules that are transported at both low and high speeds throughout the length of the tube," he wrote. "The capsules are supported on a cushion of air, featuring pressurized air and aerodynamic lift. The capsules are accelerated via a magnetic linear accelerator affixed at various stations on the low-pressure tube with rotors contained in each capsule. 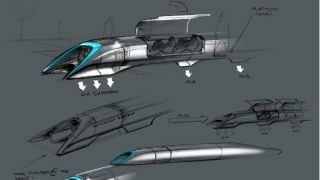 Passengers may enter and exit Hyperloop at stations located either at the ends of the tube, or branches along the tube length." If you're itching to resurrect "tubular" in the vernacular, you may be in luck. Musk told reporters (as reported by AllThingsD) that he's tempted to build his own prototype. While Hyperloop isn't his top priority, Musk indicated his involvement may get the ball, er, tube, rolling. Forget 30 minutes: Our blips will take you to the latest news and back in a fraction of the time.